To arrange a Baptism or Thanksgiving please contact the Rector. Baptism (sometimes also called Christening) and Thanksgiving are both ways that we can offer to celebrate your child in a Church Service setting. One of the purposes of this page is to explain these options to you if you are parents and to help you plan with us the right one for you. Worship should be fun and never more so than when children and young people are involved. Why do we bring our children to be baptised? For many of us, there are probably a number of reasons: giving thanks for the arrival of this precious new member of our family, celebrating the arrival with our extended family and our friends, naming the child, and recognising our child’s relationship with specially chosen godparents. Lastly and importantly, seeing our child take his or her place in the family of the Church; starting out on his or her journey with God. We believe that all of us are created to live in a relationship of trust and loving kindness with God. This involves knowing God and trusting Him, learning who He is and how much He loves us and wants every good thing for us. This is the greatest and most satisfying thing, so of course we want to share this with you and your child! For many of us, this journey with God starts with baptism, which can be one way of saying “yes” to God; one way of putting a foot on the road that He invites us to walk with Him. Giving thanks for the arrival of a child is natural and hugely important. All children are precious (even in the middle of the night, when they seem unreasonably wakeful and noisy!) and for some of us, the arrival of our child is little short of a miracle. Giving thanks to God for the blessing of new life, and for the gift of a child, is something important that we can recognise in the baptism service. The thanksgiving is, for some of us, the key part. With the naming of the child, and the celebration of the arrival, it may be more important when the child is very young, than actual baptism. The child may choose baptism for herself or himself later. The Church recognises this. There is a Service of Thanksgiving for the arrival of a child. Some families find that this service, rather than baptism, is the right one for them. They can gain much from planning a Thanksgiving service which reflects their own response to God’s goodness in giving the gift of a new child. The Bible tells us that Jesus’ parents brought him, as a small child, to the Temple to give thanks in a special thanksgiving ceremony for the birth of a child. So there is the best possible example for those who choose this alternative! Celebrating your child’s arrival is also very important. Celebration is a response to the blessings that God freely gives to us, and is a central part of the baptism. Sharing good news is always a pleasure, and in the baptism service, or the thanksgiving service, we can allow others to rejoice with us in our joy. Many parents invite the child’s wider “family” to celebrate, together with the Christ Church “family”, at baptism. “Family” means different things for different people; it may mean grandparents, aunts, uncles, and cousins; it may mean your close friends and neighbours. Some baptism families are large groups, some are very small. All are very welcome to Christ Church at any time, and never more so than at a time of celebration. The church family at Christ Church is always happy to celebrate! Naming the child is important for those of us who bring our children to be baptised. And naming is part of a thanksgiving service too. Names are powerful things. Many stories from the Bible, and stories from other sources, remind us of this. The name can represent the individual and unique thing about a person in a way different from other things about them. The name or names we give a child often carry significance for the family, too. There may be honour for other family members in the names, or remembrances of important people or things or places or times in the parents’ lives. If this is the case, we would be delighted to know. It may be appropriate for all those present at church on the day to know the reason why the names have been chosen. The Bible tells us that Jesus’ name was given by God to Mary and Joseph because of the task he would fulfil – “Saviour”. And Jesus gave some of his disciples new names, recognising their place in his love and service. Names are very important! Naming the child in the context of the church service shares this identification of the child formally with the community gathered there, and with God, our heavenly father. In baptism, your child is starting out on his or her journey with Jesus. Your child becomes a member of the family of the Christian Church, a new brother or sister for all the followers of Jesus. Since the earliest times – since Jesus’ own direction to his disciples to baptise others – baptism has been the way for a person to accept that he or she is saying “yes” to God and accepting his love as a member of the Christian family. Baptism is the start of a journey. On life’s journey with God, as on any practical journey, a young child needs much support! Supports in practical ways and in spiritual ways are both vital. The Church family – those of us at Christ Church – can offer some practical support and some spiritual support. The activities and opportunities for young families to meet, feel welcome, find a friend to look after your little one while you have a breather with a cup of tea, are certainly there. You will find information about what is going on at Christ Church in the back pocket of this booklet. 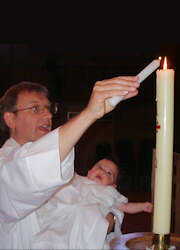 We also pray with and for baptism families and the children being baptised. Practical and spiritual support is also a key role for godparents. 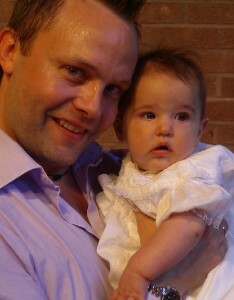 Godparents are not “essential” for a child being baptised. But many of us know how important they can be! The practical support of looking after the parents (and perhaps even the child) is a vital role, for those who are close enough, emotionally or geographically, to the parents. The spiritual support is also just as important. Prayer is a powerful thing. Regular prayer for our godchildren is a real support for them. Many godparents also remind their godchildren of their baptism by sending a Baptism card on the baptism anniversary each year, as well as a Birthday card. Celebrations appeal to most of us, and few children would object to a day out or a gift to remember the special day of entering the Church family. The baptism will be woven into our usual Sunday service and we are delighted to welcome you to our service. We enjoy having children with us in our services and do not mind the squeaks, shouts and cries that are part of the very young child’s way of worshipping. When a baby is born it is a great joy. A new human being, unlike any other has come into the world. We feel grateful to God for this new life. It is usually a very happy time for all the family, not least the grandparents and great grandparents. Naturally we want to give thanks so it is hardly surprising that the first key moment in the service is saying ‘Thank you’ to God for all this joy. Having said ‘Thank you’ to God, this is followed by all of us making promises – clear commitments – to support the child and their parents. We make promises to give support by prayer and action. The Church makes its commitment to you and your child first. Then the godparents and the parents make promises about the way in which they will bring up the child. These promises include commitments by the parents and godparents that they themselves turn to Christ, saying “yes” to Him and stepping out with their child on a personal journey with God. During the Baptism, the Rector makes the sign of the Cross on the child’s forehead. The cross is the central symbol of Christianity. It reminds us that Christ died on the cross to save us from the consequences of all the evil things that we do. In Christ Church we use a special oil to make this sign. The Bishop blesses this oil each year at a service held in the cathedral in Chelmsford. This is a reminder of the belief in God which we express, and unites us with Christians all over the world. After the water has been poured into the font, the Rector says a long prayer. In it are references to some of the most significant places where water has been the way of bringing new life, from the Bible. Jesus himself tells us that water is a symbolic way of leaving behind all that is past, and being born to new life, which is a life lived with Him. So baptism does just that. Your child passes through the water, and comes, after the water, re-born to start a new life with Jesus. •	the story of the Baptism of Jesus. The prayer also refers to the story of Jesus’ Death and Resurrection. There are also two phrases in the prayer, which are commonly used when Christians talk about their faith, both of which come from the Bible. These are ‘being born again’ and ‘walking in the light’. After the water has been prepared parents are asked to give the child the names that have been chosen. Names are often full of significance for the family and for children. This significance may be mentioned during the service. Since the earliest times – since Jesus’ own direction to his disciples to baptise others – baptism has been the way for a person to accept that he or she is accepting God’s great love, and choosing to become as a member of the God’s family, or God’s Kingdom. 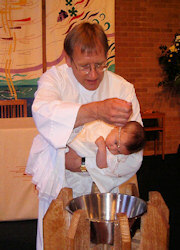 Baptism involves a ceremonial or symbolic washing so expect plenty of water! In the prayer over the water reference was made to ‘walking in the light’. Lighting a candle and giving to the parents for the child reflects this symbolism. The candle will be lit from the Pascal candle, which is new each year in the church on Easter Sunday representing the resurrection of Christ. It is lit on special occasions throughout the year of which this baptism is one. The candle is taken home and can be lit on special occasions such as the anniversary of the child’s baptism or on their birthday. Does it seem strange to have the welcome at this point, when you have already been welcomed to the church? This welcome is different. By baptism the child has formally become one of the world-wide family of Christians and so, on behalf of all of them, those present at the service formally welcome the baby as one with them – ‘pilgrims on the spiritual journey’. The Rector will usually carry the child round the church at this point. There is often applause as a way of saying “welcome”. Our time together in church is vital. But we do not stay in church all the time. We live our lives in the world; doing the work and tasks that God gives us to do. For young children this is all about growing up and learning, for those of us who are older it will be about earning our living, serving our community, praying, living, having fun. Each Sunday at the end of the service we are sent out from church with a blessing. It will be no different at the end of the child’s baptism for it is not really an end at all, but rather the beginning of their Christian journey. The Thanksgiving is a part of the Sunday morning worship at Christ Church, taking its place in the worship, prayers and preaching of the day. Within that Service, the Thanksgiving is a special section. This part of the Service starts by stating clearly that we are here to give thanks for the gift of the new child, and may include a song or hymn that is appropriate for this. This is the central moment. The Rector asks the parents if they receive their child as a gift from God, and if they wish to give thanks to God and to seek his blessing. The Rector then says a prayer of thanks, recalling the wonder of new life, and acknowledging our relationship with God who knows us all by name. There is a blessing for the child, and for the parents. And the whole congregation prays for them. A copy of the Gospel is given to the child. The Rector asks the family and the congregation for their support for the parents in bringing up their child, and then praises God for the gift of children, praying for guidance and patience for all who help children as they grow. During the course of the Booklet a number of stories and passages from the Bible have been mentioned. If you would like to read these you can find them in your Bible if you have one. If you don’t have one, please let us know; we would be delighted to make you a gift of a Bible. Creation. There are two accounts of the creation of the world by God. The accounts tell how God brought life out of the water at the very beginning. Moses and the Red Sea. This passage tells the story of Moses dividing the water to lead the Children of Israel out of Egypt where they had been slaves. When the angel visited Joseph, he told him the name that God had chosen for Jesus. Isaiah had prophesied this many years before. Matthew chapter 1 verse 23; and Isaiah chapter 7 verse 14. The Death and Resurrection of Jesus.